Your Rebel T6 gives you a variety of options with Creative Filters. With the Creative Filters, you can add special effects to your pictures. 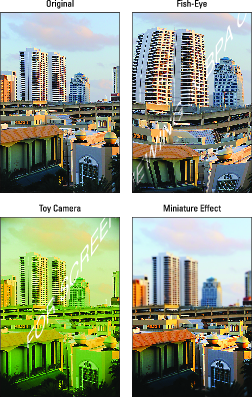 For example, these three versions of a city scene were created with these filters. The Creative Filters feature was used to create these variations on a city scene. When you use this feature, the camera creates a copy of your image and applies the filter to the copy; your original remains intact. If the original was captured using the Raw Quality setting, the altered image is stored in the JPEG format. Grainy B/W: Creates a black-and-white photo with a speckled appearance. Soft Focus: Blurs the photo to make it look soft and fuzzy. Fish-Eye: Distorts your photo so that it appears to have been shot using a fish-eye lens, as illustrated in the top-right image above. Toy Camera: Creates an image with dark corners — called a vignette effect. Vignetting is caused by poor-quality lenses not letting enough light in to expose the entire frame of film (like in toy cameras). When you choose this effect, you can also add a warm (yellowish) or cool (blue) tint. For example, this effect was applied with a warm tint to create the lower-left variation above. Miniature: Creates a trick of the eye by playing with depth of field. It blurs all but a very small area of the photo to create a result that looks something like one of those miniature dioramas you see in museums. This filter was applied to the city scene to produce the lower-right variation above. This effect works best on pictures taken from a high angle. Quick Control screen: After setting the camera to Playback mode, press the Q button and then use the up/down cross keys to highlight the Creative Filters option, as shown on the left. Symbols representing the available filters appear at the bottom of the screen. Use the left/right cross keys to highlight a filter icon, as shown on the right, and then press Set. During playback, press Q to access Creative Filters. You see a preview of your photo with the currently selected filter active. You have the option of making changes to the settings before you apply and save: Press Set to display options available for the selected filter. The screen on the right side shows the adjustment available for the Soft Focus filter, for example. For the Miniature effect, use the up or down cross keys to change the position of the focus frame, which determines which part of the image is kept in sharp focus. Press the DISP button to change the orientation of the focus box. Playback Menu 1: Highlight Creative Filters and press Set. The camera shifts to Playback mode. Use the cross keys or Main dial to select a photo, press Set, use the cross keys to select a filter, and then press Set again to access any available filter options. After adjusting those settings, press Set. Either way, after your final press of the Set button, you’re asked whether you want to save the altered image as a new file. Choose OK and press Set. Or, if you want to cancel out of the operation, press Menu. You’re returned to the filter-selection screen so that you can choose a different filter.